Stomach sleepers may be harder to find than you think. In fact, only about seven percent of the population sleep on their stomachs, according to the National Sleep Foundation. The rough news is that health professionals do not recommend stomach sleeping because it makes it difficult for your back to find a neutral spinal alignment and it’s rough on your neck. But there is one positive: it helps with snoring! 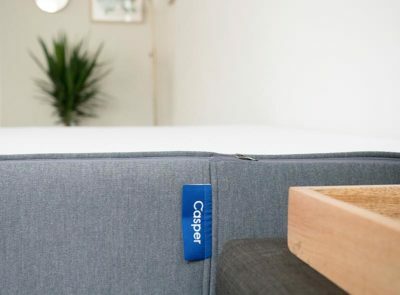 For those who are committed to sleeping on their stomachs, we’ve put together our top picks for you, as well as more information below on what exactly stomach sleepers should be looking for in their next pillow. 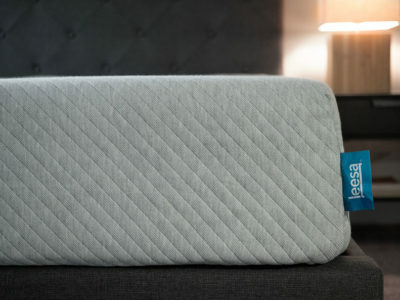 The Sleepgram pillow is filled with polyester microfiber and features two inserts with different firmness levels. This means stomach sleepers can use a variety of combinations without getting messy and still find a great fit. 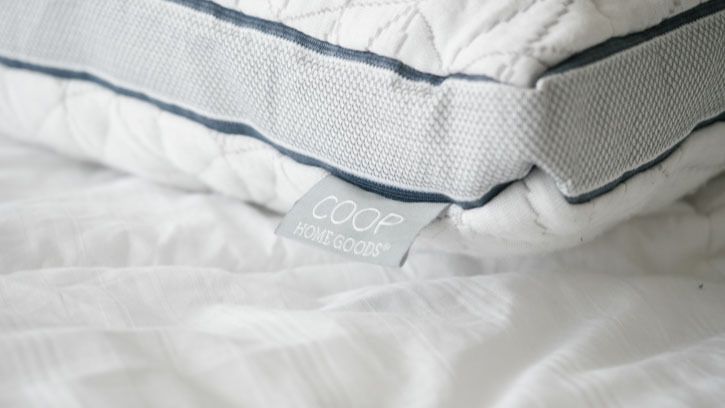 Coop Home Goods Eden pillow is filled with a mix of cross-cut gel memory foam and polyester fibers. It is adjustable and gives stomach sleepers much needed support but with a super plush feel. Leesa's pillow is a single piece of ventilated Avena foam (a latex-like) foam. 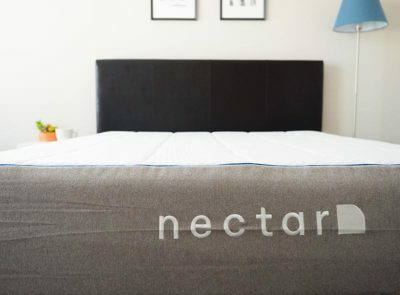 It's not too firm and has a smaller height profile that's a perfect fit for stomach sleepers who just want a solid foam pillow to rest their head's on. Snuggle-Pedic's adjustable shredded foam pillow has a soft knit cover that has a bamboo textile blend. The whole pillow is machine washable and dryer friendly and the small pieces inside mean no lumps or bumps on the side of your face while you sleep! Brentwood Home’s Helena pillow is a unique blend of natural latex ribbons and organic and pesticide-free Kapok fibers (see more HERE). The mix gives the pillow a soft feel – similar to a down alternative but with a little more support because of the latex ribbons. 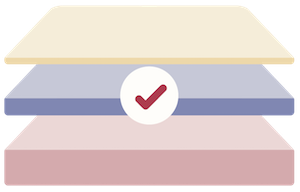 There are two specific features that make it a good fit for stomach sleepers is that it’s an adjustable pillow and the filling is easy to manipulate within the pillow. Stomach sleepers can make the filling as thin as they’d like and make sure the layer is spread evenly within the pillow. Check out the full Brentwood Home Helena pillow review, here. 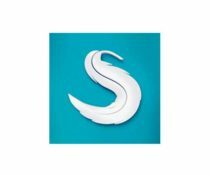 Sleepgram’s innovative design can make it a great fit for stomach sleepers who prefer the feel of a down or down alternative pillow. The pillow features an outer cover and two inserts are filled with different levels of polyester microfibers. Stomach sleepers can remove or combine inserts and the outer cover to find the right firmness and loft combinations. You are not able to access the actual filling, which means no mess and the whole pillow is easily machine washable and dryer friendly for easy cleaning. Based on my experience, stomach sleepers will want to take at least one or two inserts out. Why Coop Home Goods Eden? The Eden pillow from Coop Home Goods is filled with a mix of uniform cross cut gel-infused memory foam pieces and polyester fibers. 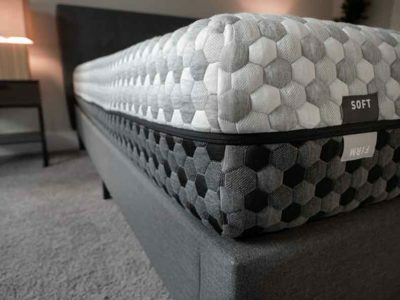 The memory foam pieces provide support and their consistency stops the pillow from feeling too lumpy. The down fibers hold the pieces together and give the pillow a plusher feel. I like this pillow for stomach sleepers is because the filling is adjustable. Stomach sleepers can remove a good amount of it and find that perfect spot where support and softness come together. You can also remove the cover and the pillow is machine washable and dryer friendly. 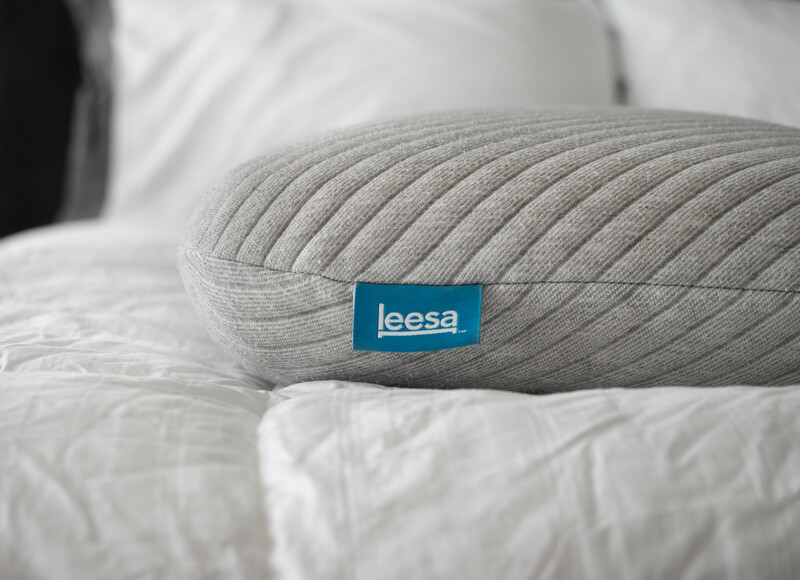 Leesa’s solid piece of Avena foam filling is a good fit for stomach sleepers who want a supportive pillow – that’s still on the flat side – that won’t change shape or go flat on them overnight. Avena foam is similar to latex foam in that it has good responsiveness and support – but your head won’t sink in too deeply like memory foam. 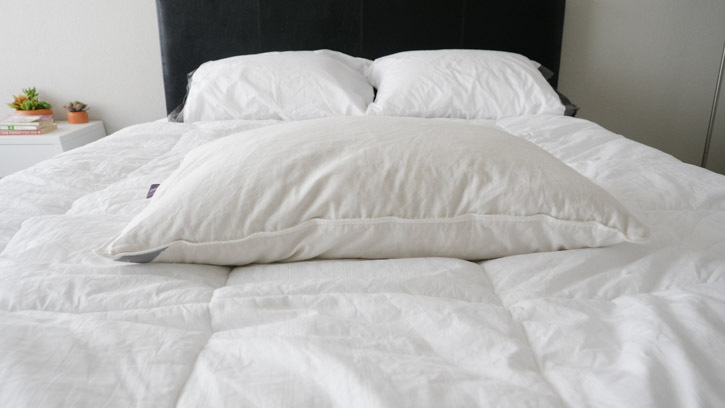 Sometimes pillows with solid foam fillings can have trouble breathing, causing people to sleep hot. The foam in the Leesa pillow is ventilated which promotes airflow, and the soft knit fabric helps it to stay cool as well. You can remove the cover and machine wash and dry it if needed. 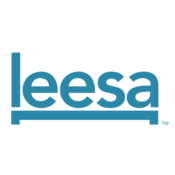 Check out the full Leesa pillow review, here. The Snuggle-Pedic is filled with a proprietary shredded memory foam mix (see more HERE). It is also an adjustable pillow, which means you can take out as many handfuls of the foam pieces as needed. The nice thing about the Snuggle-Pedic – and why I would suggest it for stomach sleepers- is because the pieces of shredded foam tend to be smaller in size. You can truly remove enough of the foam to still have support but you won’t experience large chunks of foam pressing unevenly against your face. The pillow also has a really nice soft breathable cover that has Kool-Flow micro-ventilation. It’s also hypoallergenic and dust mite resistant. Read the complete Snuggle-Pedic Adjustable Shredded Memory Foam pillow review, here. 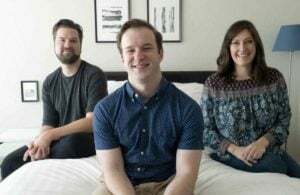 When it comes to picking a pillow that aids in stomach sleeping, the key is to avoid anything too thick that will add stress to your neck, experts say. “Any pillow with high loft is going to push your neck back a little bit and give you neck pain or cause some discomfort in the lower back,” says Rocco Monto, MD, an orthopedic surgeon in Nantucket, Mass to Health.com. Monto recommends choosing a pillow that’s about three inches thick ensures your spine stays aligned while you snooze. 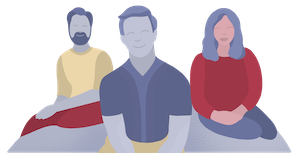 In addition to choosing a flatter pillow, sleep professionals also recommend adding a second pillow to the mix – but leaving it under your stomach. 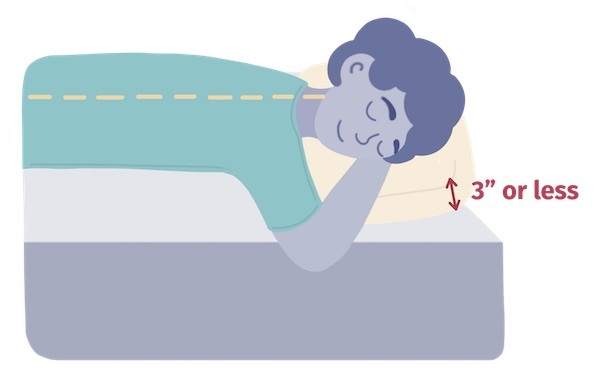 “Sleeping on your stomach can create stress on the back because the spine can be put out of position”, say experts from the University of Rochester Medical Center in Rochester, New York. They suggest placing a flat pillow under the stomach and pelvis area can help to keep the spine in better alignment. If choosing a foam-based pillow, look for ventilated holes in the filling and a breathable outer cover. Many come made with phase change materials that will help draw heat away from the body while you sleep at night. If your face is sensitive, look for a pillow that is hypoallergenic. Some pillow covers are also blended with bamboo (like the Snuggle-Pedic) or copper (like the Layla pillow) that have antibacterial and antimicrobial properties. If you are not big on texture, keep in mind that some pillows may have covers designed with a textured fabric that can be felt underneath a traditional pillow cover. Some also have cooling properties that make them feel cool to the touch. These can sometimes come through pillow covers as well, too. In general, sleep professionals don’t recommend stomach sleeping because of the strain it can put on your back and your neck. That being said, if it’s what feels right to you, it’s worth picking a pillow that creates the most even spinal alignment possible. 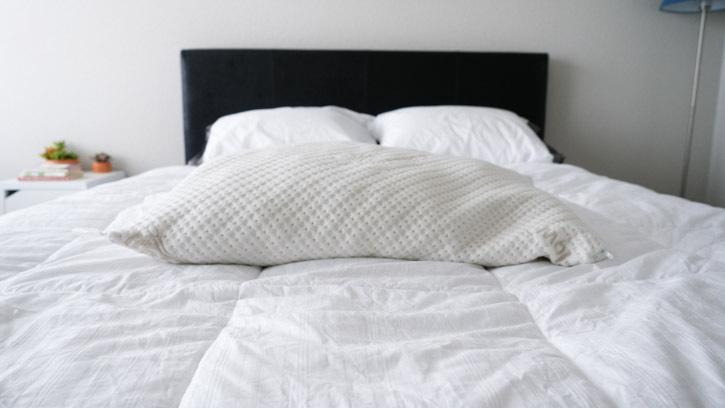 You can do this by looking for a thinner or flatter pillow – preferably one with a profile no higher than three inches (this guideline may vary on personal preference). Adjustable pillows might be your best bet since you can customize it to whatever feels good for you. 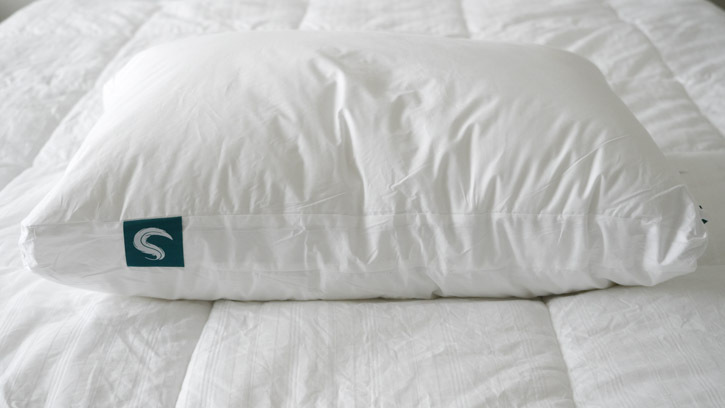 Best Pillows for Side Sleepers: Check out our top picks here.